About Vince D. Message Vince D.
TOUR GUIDE RESPONSE: Thank You for your kind words. I truly enjoyed your company ! Vince was a lovely guide. Very knowledgeable and flexible to the needs of the group. We loved every minute of the tour and we loved Malta. Will definitely come back. TOUR GUIDE RESPONSE: Thanks Frances! Glad to have spent those few moments with you and YOUR lovely group ... and looking forward to meeting you again. Tourguide was too serious Tour was expensive for what we covered. TOUR GUIDE RESPONSE: Thank You for taking the time to give your opinion. I am very concerned about my behaviour with guests, of course and I always make sure that it is always correct. That precludes me from getting over-friendly... and I have been so my entire career. Regards Value for Money, I assure you that you may find cheaper alternatives as is the case in food or accomodation etc. Regretfully there are individuals ready to pretend they are guides without doing the necessary courses and studies. Our guide seemed unwilling to share his hometown willingly? He was more like "what do you want to know?" The visit on Sunday had some limitations that were beyond our control. Valletta, Malta was a walking tour but must have a backup itinerary for a Sunday visit. The visit to the city walls was interesting. We missed the timing of the cannons. Next time, I'll just work with a taxi and plan my own visit to include history and local food. TOUR GUIDE RESPONSE: Thanks for analysing the tour. As you said, the tour you chose of Valletta is a walking tour and I and other TbL guides offer tours with transport to outlying towns which enable one to see a different environment. These are not backup tours but cater for a different clientele. 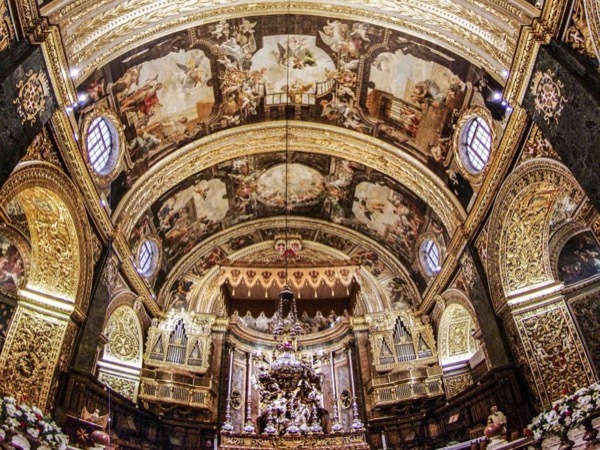 The only sites in Valletta closed on Sundays are churches but that applies to the entire island (see Tour Description). As Malta's History of 8,000 years cannot be covered in 4 hours, I ALWAYS ask what guests are interested in. We had a really great day, Vince is very knowledgeable and gets in everything you want to see! Thank you!! TOUR GUIDE RESPONSE: Thank YOU Heather for your interest in Malta - I really appreciate people who enjoy the Art and Architecture and Natural History the way you did. Vince was here ahead of time, and patiently waited for and tolerated our group of 4, because one is handicapped and was less able to walk than he had quite understood (or I had made clear) when I made the reservation. He tooks everywhere on the island possible. Accommodated our friend who also was feeling bilious. Got us in the places we might not have seen with everyone. He answered every question knowledgeably, accurately, and objectively. His English is excellent. Thank you. Vincent was excellent and very engaging. Our tour was more of a stroll, with commentary as we walked along. Thoroughly enjoyed it. TOUR GUIDE RESPONSE: Thank You Bill. I'm glad we clicked and had a relaxed look at Valletta..
We loved this tour. Vince knew exactly where to take us and showed us some really interesting aspects to Malta. Malta is beautiful! Vince took us to a fabulous coffee shop with an extraordinary view. It was very special. After several hours it was time for us to move on. Vince recommended a fabulous restaurant for dinner where we enjoyed local produce and we did. Vince, you were a pleasure to spend the day with, thank you for the special memories. TOUR GUIDE RESPONSE: Thank You Melisa.. I am glad you have pleasant memories of little Malta. Thank you especially for your company. Vince did a great job taking us on a short tour of the old part of Valletta. We had to cut our time short due to a miscommunication with our cruise ship, but Vince gave us an informative and amusing tour that we thoroughly enjoyed. TOUR GUIDE RESPONSE: Thanks David. All the more reason to come back for a few days. Vince led us on a 6 hour tour of Malta, with a driver dropping us off at each location. Vince is a wealth of historical information and was realistic about which sites we should visit. Very comprehensive and enjoyable tour. Thanks, Vince! TOUR GUIDE RESPONSE: Thanks to you Barbara for your comments. I'm glad you enjoyed our short visit. TOUR GUIDE RESPONSE: Thanks Daniela. Best Regards to your fantastic families - you all turned the day into a good outing. It was a good day seeing all of Malta. I did not wish to walk around that much, and so did not. I did feel that even though I had made this clear initially, I was expected to do more than I did. I believe it is "my tour" and can set my own pace. Vince was not always the easiest person to understand (English) for me. We were picked up in a timely manner. TOUR GUIDE RESPONSE: "Dear Karen, Thank you for your rating and I am glad you had a good day seeing Malta. Just like you mention, it’s your tour and that is why I offer options to my customers and let them decide. As for my English, I am sorry you struggled to understand me. We all have accents and had you mentioned that you were having trouble understanding me, I would have spoken a little bit slower and chosen simpler terminology. Thank you"
Vince was extremely knowledgeable. He relied on us a bit too much for guidance on what to see. As we had very little background on Malta, we hoped he would have provided us with a bit more structure. If I had more experience, I would use him again. TOUR GUIDE RESPONSE: Hello Monte, Hope your trip is proceeding well. Thanks for the time to give me your feedback. And now that you know what to expect, I'll give you much more next time. You are coming back aren't you ?! Malta or even Valletta is difficult to do well in a few hours, which is why I constantly adjust the tours to the individual visitor. Should you wish, I can help with the planning of your next Malta trip - but do make it a week at least. We had no idea what to expect from Malta -- and did not know it's amazing wartime history. The war museum and the war rooms helped us understand the importance of Malta as a strategic location. Vince instructed us on a lot of this (he is extremely well-versed in history), but also showed us the sights of Mdina and Valetta. We also got to eat Maltese traditional food! We had a terrific day out with Vince exploring all of Malta's treasures. We especially appreciated Vince making time for us on Christmas Day. His historical knowledge and anecdotes made a wonderful present! TOUR GUIDE RESPONSE: Thanks for your thoughts. I hope that you are enjoying the rest of your stay and finding yet more of Malta and Gozo's treasures ! Touring with Vince was a joy. he was most courteous and we felt like we had seen the best of Valletta. Vince catered to all our requests and I would not hesitate to use his services again. TOUR GUIDE RESPONSE: Thank You Barry. Hope the rest of the trip was pleasant. I certainly look forward to meeting you again. Best Regards from Malta. A great way to see as much of Malta as you can in a day. Vince is easygoing, and this relaxed us in our touring. He was very informative and pointed out things that were relevant to our interests. We took day-long tours with him that were very enriching. TOUR GUIDE RESPONSE: Thanks Bruce. Touring with you was a pleasure since you all took such an interest in my country. I am happy we met as I felt I was learning more through your insights, on both the cultural and human levels. Vince was an incredible guide, showing us exactly what we wanted to see within our interests. He was knowledgeable about history, archaeology, church history, beautiful sites. We were thrilled with Valetta, Mdina, the coast and stories of the culture. We are anxious to return and would recommend Vince to anyone. Since we are older, he respected our limitations, but I'm sure could be an excellent guide to any age person. Particularly outstanding is the Church of St. John. Kudos to Vince. TOUR GUIDE RESPONSE: Thanks for your kind words. Best of all I liked the part where you said you are anxious to return. I'm looking forward to meet up again (off duty !) as you were such good company. Our tour of Malta was all we could have hoped for. Vince was most accommodating in taking us on a tour virtually right around the island and showing us all the things we particularly wanted to see. Unfortunately our time ashore did not permit an in-depth investigation of everything, but we did manage to see, among other things, the only painting Caravaggio ever signed, which hangs in the museum of St John Co-Cathedral, plus a heap more. Thank you Vince for a great day. Took the tour with Vince as a shore excursion. Much better value than sharing a bus with 20 -30 others as so much more was seen in better comfort. Just myself and my wife and a great time was had. We had a wonderful day with Vince! We now have an appreciation of both the fascinating history and beauty of Malta. We can't believe how much we were able to see in such a short time without feeling rushed. Vince was kind and patient with my 10 year old granddaughter. I highly recommend this this tour. Thank you for the great memories. TOUR GUIDE RESPONSE: Thank you very much for your comment. I assure you I was happy to share the day with you. Vince was very pleasant and accommodating. He was knowledgeable about both the geography (how to get to places) and the history. I would recommend him to anyone visiting Malta. Vince did an excellent job touring us thru Malta. His love of his home island and his knowledge were excellent. We enjoyed our day. Dear Vince was a very professional and passionate guide. He thoroughly showed us the understated destination of Malta. If you want to see Malta there is only one guide and that is Vince. Vince was awesome. We went all over and he seemed to know everything about each place that we went. He found us a nice restaurant for lunch and we all enjoyed our day in Malta. TOUR GUIDE RESPONSE: Thanks for your company on the day! Vince was a great guide with knowledge abound. His personality really hit the mark with our group of 6. If you visit Malta, Vince is your guide!